This report examines the changing role of the non-profit social services sector in Alberta, the reasons for this change, and some of the resulting implications for the sector. The sector has a long and distinguished presence throughout Alberta. In 2015, Alberta was home to 24,800 non-profit organizations. In 2011, 38% of all non-profit organizations performed social service functions. Alberta's non-profit social services organizations receiving provincial government revenue over $1 million employed 20,825 paid staff, of which 56.1% were full time. Alberta's non-profit social services organizations receiving provincial government revenue under $1 million employed 9,791 paid staff, of which 53% were full time. The non-profit social services sector has undergone a number of experiments since the 1990s. Many of these experiments have been based on neoliberal approaches, including the Alberta Response Model, the Casework Practice Model, Outcome Based Service Delivery, and the Social Innovation Endowment Fund. This report highlights the dangers of adopting neoliberal programs and policies. Vital non-profit services have been misused and even abused by past government policies – to the detriment of non-profits and also to the detriment of the social services system. Generally it is taxation and royalty policies that limit government revenues in Alberta and thus leave the social services sector vulnerable to the developments described. Albertans have long relied on the non-profit social services sector to fulfill a host of local needs additional to and vital beyond those met by the public sector. The non-profit social services sector – indeed, all areas of the non-profit sector – deserve more recognition than is often given. At the same time, the non-profit sector is not now – and cannot be – a substitute for a well-paid, well-trained, reliable and professional public sector. The non-profit sector can provide some complementary services to the role of the public sector, but the two are not equally capable sectors. The first step in ensuring quality social services for Albertans must be support for and the revitalization of the public sector. Government policies directed at expanding the non-profit sector into areas for which it is not equipped undermine the public sector's ability to provide necessary services, while also risking serious damage to non-profit organizations, the people they serve, and their specific community needs. 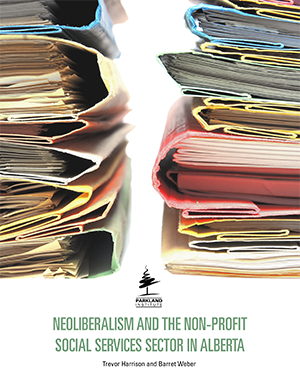 This report highlights the largely negative impacts that neoliberal approaches to governance have had on non-profit organizations, specifically as they relate to social services delivery. It is clear the primary motivation of such approaches has been to reduce the cost of public services and not, as widely promoted, to increase efficiency or the autonomy for non-profit agencies. the contributions of the non-profit sector to Alberta's economy. 2. Full disclosure of contracts and their conditions between non-profit organizations and the government should be made available to the Auditor General, and details should be made readily available online to the public. 3. The respective roles of the non-profit and public sectors in social services delivery should be better and specifically clarified in legislation and in practice. 4. The Government of Alberta should commit to adequate, long-term, sustainable funding for both the public and non-profit sectors through Alberta Human Services. 5. The government should implement legislation to defend the traditional advocacy role of non-profit institutions as guardians of the public interest, such as through the enhancement of whistleblower protection. Barret Weber is a former research manager with Parkland Institute. He completed his PhD in the Department of Sociology at the University of Alberta.